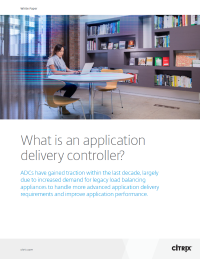 Download this white paper to learn the core services ADCs provide and its benefit to both users and application administrators. Today’s worker is demanding information as quickly as possible and from any location. Because of this, IT must make certain that workplace servers and applications are available around the clock. As applications evolve, so too will application delivery controllers (ADCs) that will ensure the secure delivery of applications and data to the user.